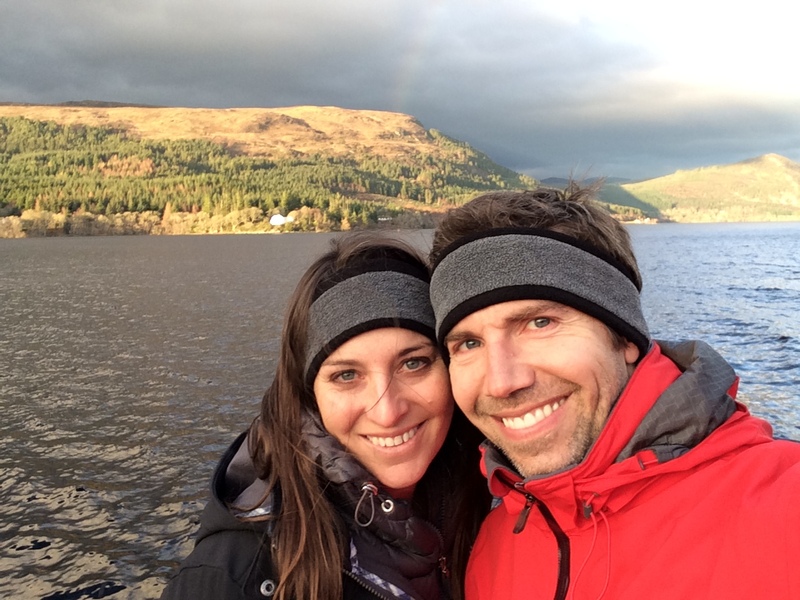 UK, PART II: So Lochy! Hogmanay in Scotland. [See UK, Part I about Christmas in England here.] First, a note of appreciation for Heathrow’s Terminal 5. This may be the best, most efficient airport terminal I have been to. Having adding Santa’s gifts to our luggage mass (while still a mere shadow of the debacle of hauling our year’s worth of stuff to Europe in the first place), we did have a fair amount to schlep. First, we walked the 15+ minutes from our friends’ house to the tube stop; even the 9 year old carried almost 50 lbs. Then just a few tube stops, and we got to Heathrow, and (because it’s not the U.S.) there were immediately free luggage carts. Yes! From there, easy peasy. Goodbye, England! We loved spending our Christmas holiday with you! 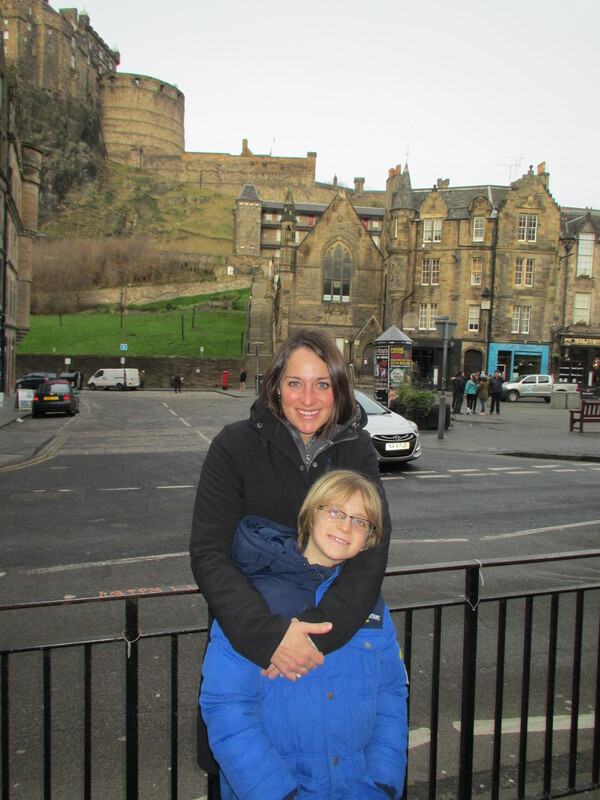 Our AirBnB in Edinburgh was in the awesome location of Grassmarket, a really cute, pub-filled central neighborhood with great views of Edinburgh Castle. The apartment itself was just average comfort-wise, but the host was the best we’ve had yet. We didn’t meet him in person, but his instructions were clear, extremely thorough, and he had already stocked the kitchen with everything we’d need (coffee, milk, cereal, bagels, bananas… and good WHISKY! Seriously – he actually encouraged us to consume it). He had even bought two uncannily appropriate magazines for the boys (Minecraft and soccer). So thoughtful! Aside from the amazing location, we could also see the castle from the bedroom, which was especially excellent for a New Years Eve stay. 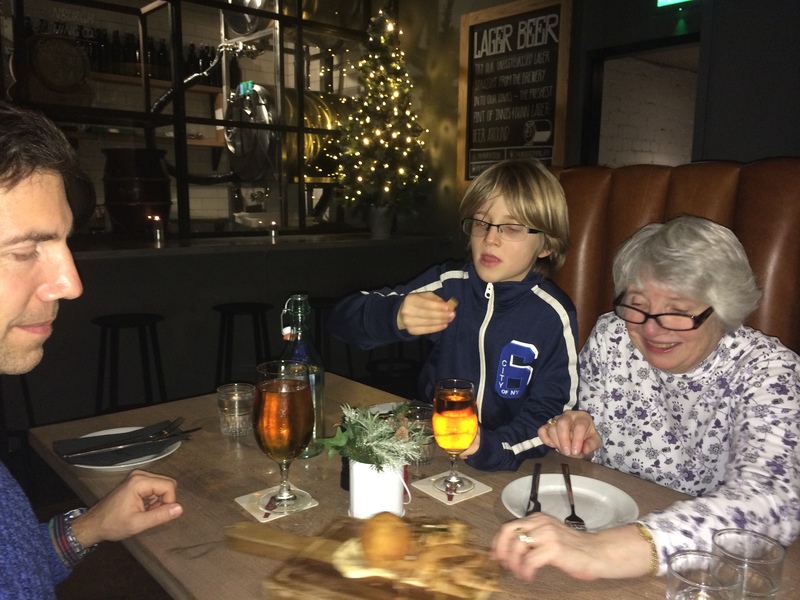 After settling in, we met up with my mother-in-law, who had flown over earlier in the day from the U.S. and stayed in a hotel around the corner. Such fun to see family! We were soon enjoying a Scottish dinner that included haggis(!) – actually a “haggis donut” – which was surprisingly GOOD (I never thought I’d say that). PapaHatch did manage to set his menu on fire, which luckily neither burned down the restaurant nor seemed to faze anyone around us (“it happens all the time,” said our cute waitress). 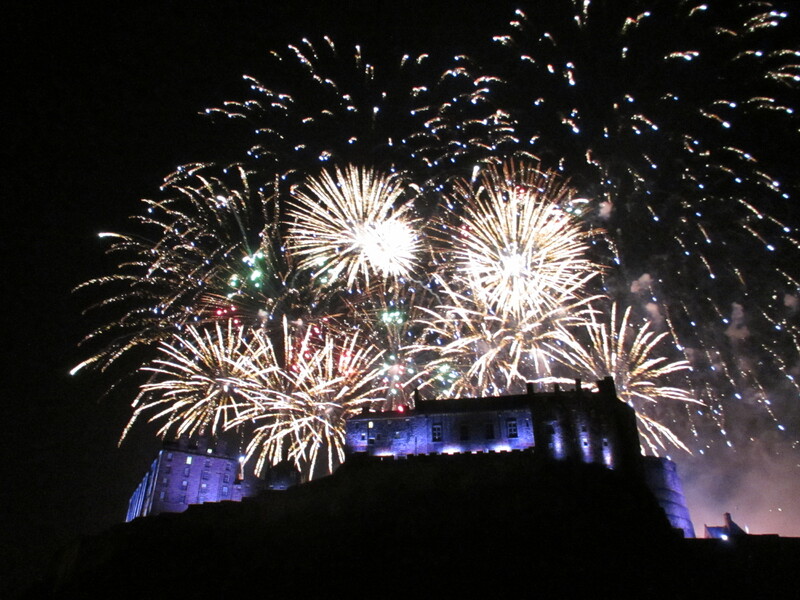 So… Hogmanay. 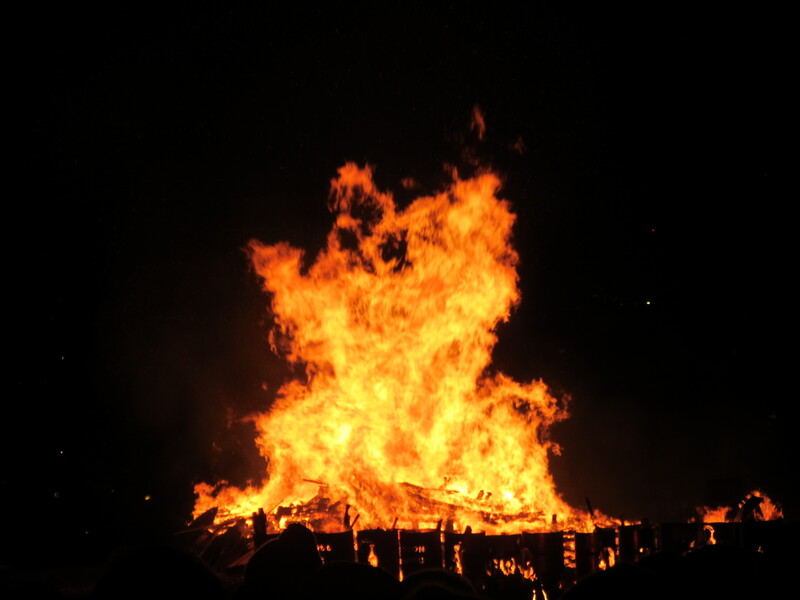 It’s the Scottish celebration of New Years, and apparently the reason it’s such a big deal there is that for 300-400 years (17th to mid-20th centuries), Christmas celebrations were virtually banned by Protestant acts and laws. So the Scots poured their energies into celebrating the new year. And celebrate they do! The main event of the multi-day festival in Edinburgh is the adult-only street party, with multiple musical acts and lots of drinking. For obvious reasons, we skipped this. 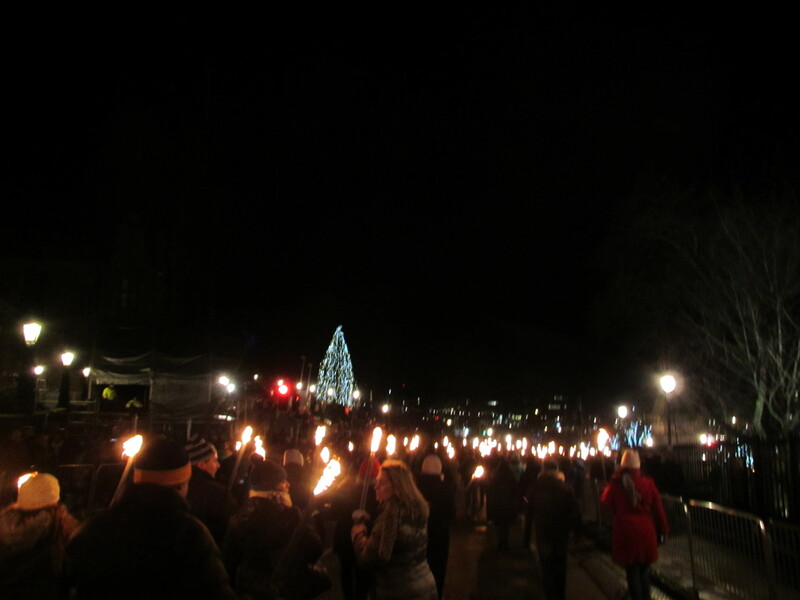 The event I was most excited about was the Torchlight Procession – on Dec. 30 after sunset, people of all ages gather with long wax torches to walk a one mile route through Edinburgh to Calton Hill, where there are then celebratory fireworks and a sound and light show to officially kick off Hogmanay. One son opted out in order to get some quality time with Grammy, but the other three of us braved the chilly temperatures and had a wonderful time. 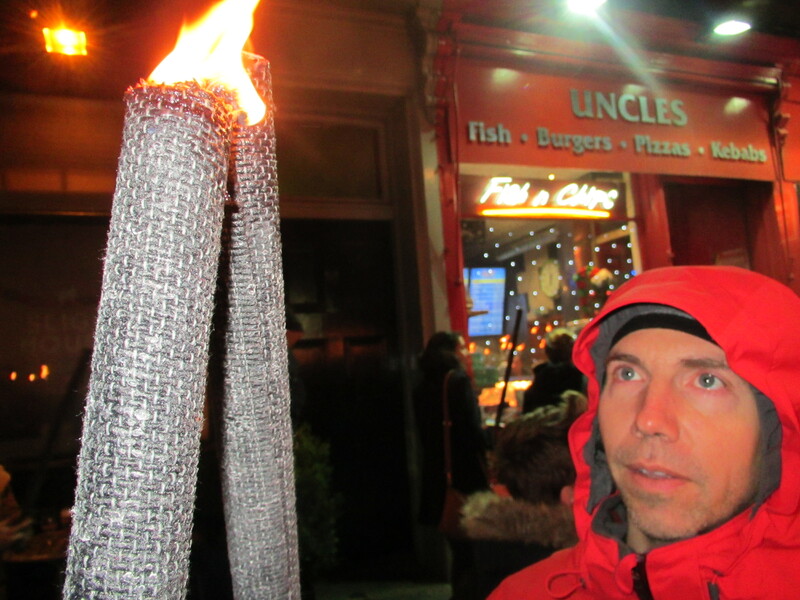 Seeing the “river of fire” walking through Edinburgh and partaking in the festive atmosphere was really special, and we ended up in a fantastic spot to see the culminating light show and fireworks. I will cherish this memory – really loved it. 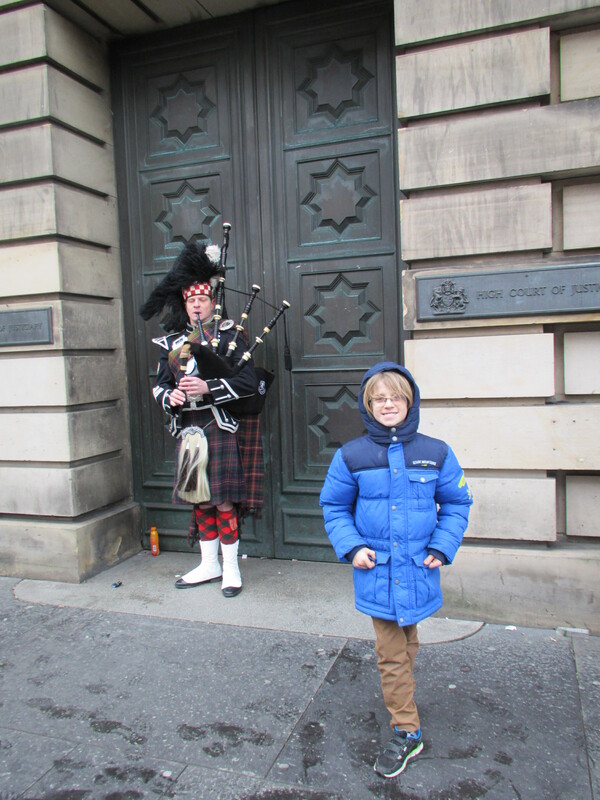 Edinburgh is a great city, and we came away with a very positive impression of the Scots. They’ve had a tough history – one filled with oppression and violence – and yet, they remain friendly and helpful, and their cultural pride shines through in an inspiring way. Both times we took a public bus, a friendly local offered to help us without us even asking. 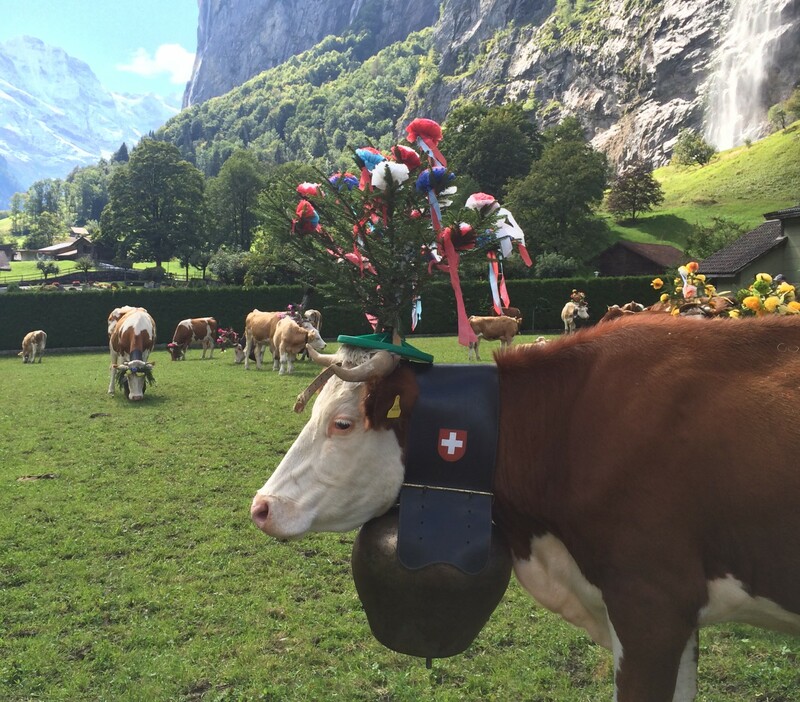 I guess we didn’t manage to look like locals…. Other sights in Edinburgh we took in included the National Museum of Scotland (free! ), which is in a cool but huge and confusing building. 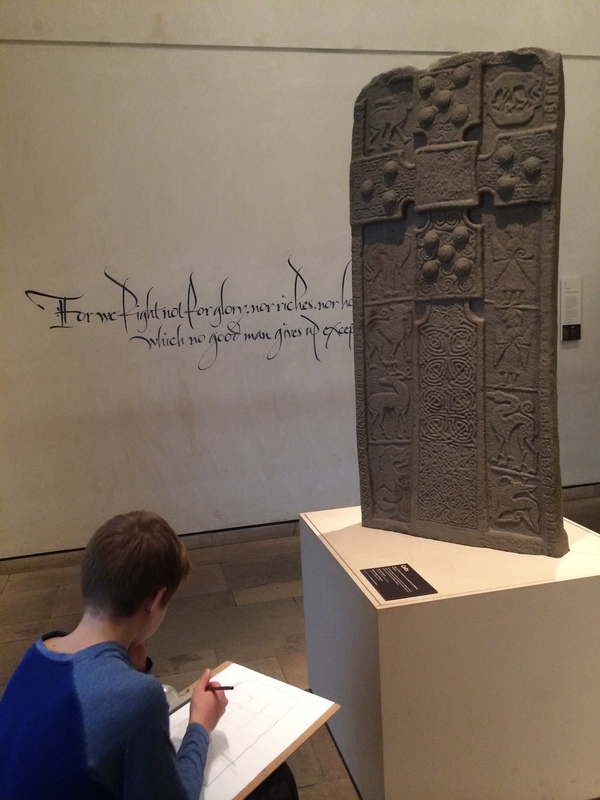 It was a bit dry, but the boys enthusiastically participated in an art contest (sketch any item in the museum – the 11 year old won 3rd place, we were just informed a few days ago! ), which entertained them for a really long time. 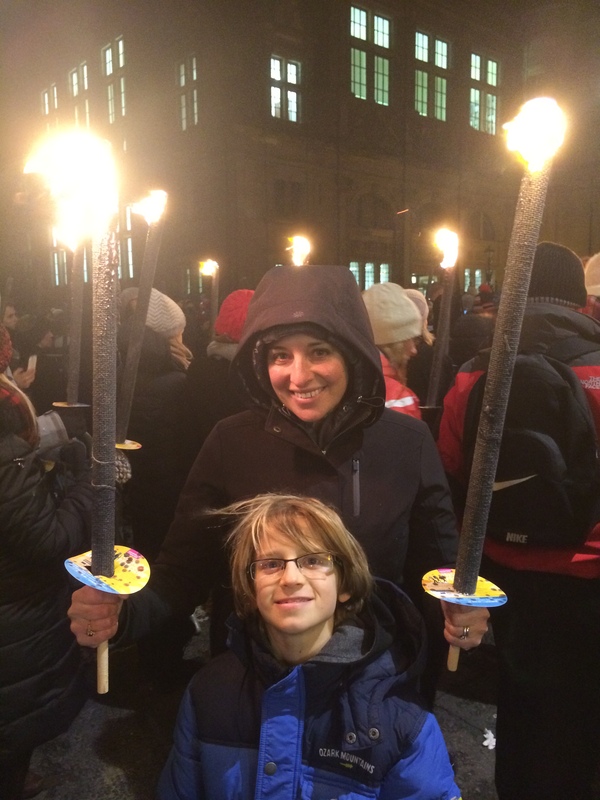 The adults absorbed what we could (William Wallace! Robert the Bruce! Mary Queen of Scots! English oppressors!) and were exhausted by the end… but I guess it’s all relative (none of our party was drawn & quartered or guillotined). 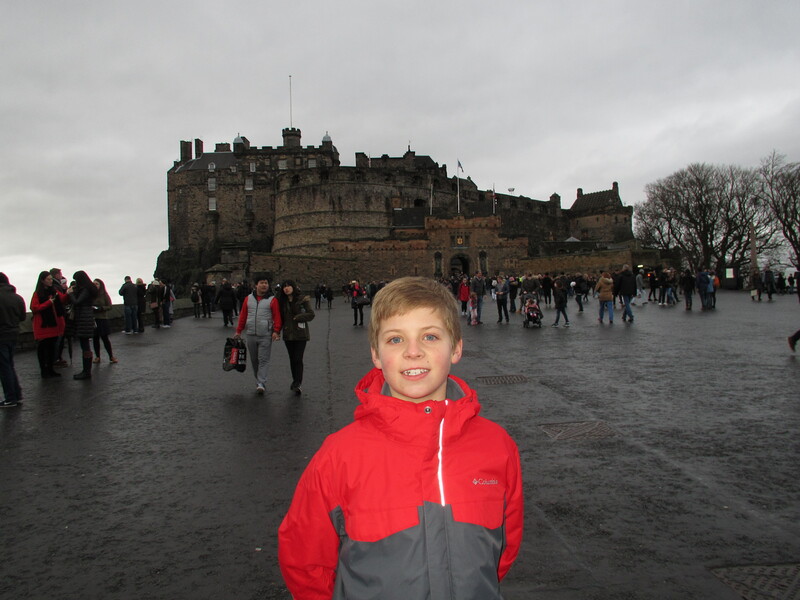 We did enjoy the visit to the castle – great views over the city, a military exhibit that I found boring but was enjoyed by everyone else, and the crown jewels, which also featured the “Stone of Destiny” (a.k.a. Stone of Scone) – more on that later. On New Years Eve itself, we opted out of the Keilidh (pronounced “kay-lee”), which was the big traditional dancing event next to the street party. I had bought tickets, but reconsidered when thinking about our group’s age range and tolerance for standing out in the cold for hours. We managed to sell them (recuperating most of the cost) and opted instead for a pleasant dinner and heading back for an early night. PapaHatch and I stayed up watching a movie, emerging out onto the balcony at midnight for an eye-popping fireworks show right over the castle. Loved. 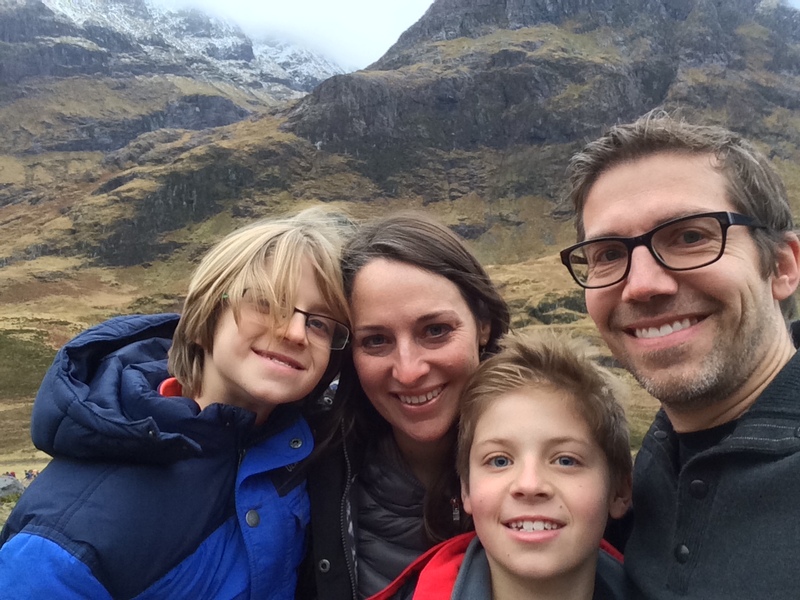 A real highlight for all of us was a “Highlands & Loch Ness” tour that PapaHatch made happen only a couple of days in advance. I had originally considered including it on our itinerary, but many TripAdvisor forum posts advised against it at this time of year – too few hours of daylight (sunrise: 8:44am but seems later due to overcast skies; sunset at 3:50pm), bad weather could mean impassable roads, icy winds may mean utter misery. 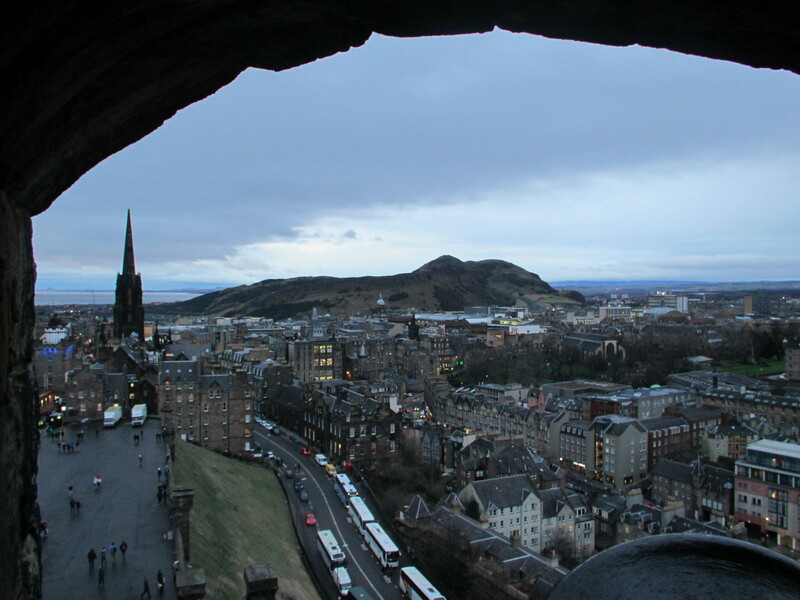 However, after looking at the relatively mild forecast and the excellent reviews of Rabbie’s tours, we went for it. We specifically chose this tour company for the small size of the group – guaranteed to be less than 16. This has quickly become a KEY criterion for any tour we will choose from here on out. This was the same size tour we had in Iceland, which we loved. I feel strongly that a smaller group provides a FAR better experience than a bigger bus tour. Our guide, Dougie, was the perfect balance of entertaining, charming and informative. He was an expert in Scottish history, geography, genealogy and music (a musician himself, he played Scottish music of various kinds including – by request – a song of his own). A benefit of a small group is that we could be more nimble, and because we were apparently running ahead of time, Dougie made an unscheduled stop for us – a scenic ruin of a riverside castle. 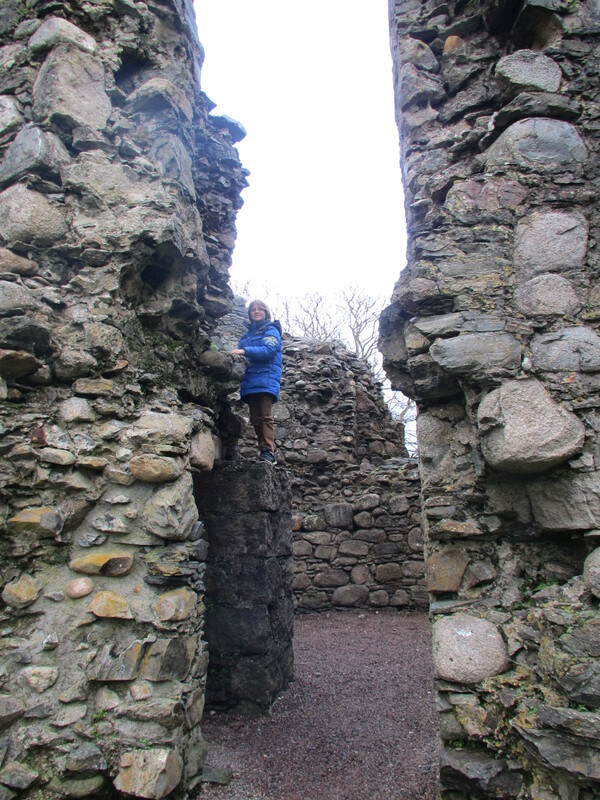 This was a dream come true for our 9 year old, who had long dreamt of just happening upon a ruin that he could actually climb all over. Dream fulfilled; he can now leave Europe happy. A highlight of his stories for me was a personal account about the Stone of Destiny, a stone of great importance to Scotland, supposedly brought from the Holy Land… or Ireland… or western Scotland. Regardless, the English stole it from the Scots way back in 1296, and it has been used in coronation ceremonies ever since. Apparently there is some question about the authenticity of the Stone. Some believe that the one stolen by the English was a fake from the beginning, and the real stone was hidden, the location of which is still a mystery to all but a few (or maybe no one anymore). Then, in 1950, a group of students from Glasgow stole it from Westminster Abbey in order to bring it back to Scotland. It broke in half during the journey, but it was eventually delivered to the best stonemason in Scotland, Robert Gray. Eventually, it was returned to Westminster Abbey, only returning to Scotland in 1996 due to public pressure. HOWEVER, Dougie told us a very interesting tidbit. His own father apprenticed with Robert Gray at this time and says that Gray not only confirmed that the stone was from the Scone area (meaning not from the Holy Land, Ireland or another part of Scotland) but also made 6 identical copies of the stone at that time. So, which version was returned to Westminster Abbey (and then back to Edinburgh Castle in 1996)? And if the stone stolen back in 1296 was a fake anyway, is the one we saw at the Castle a fake of the fake? Fun to think about, and I loved Dougie inserting his own personal story into the mix. The Scottish Highlands were absolutely stunning – dramatic, dreamlike, dotted with mysterious lochs (lakes) and with a beauty that was both breathtaking and bleak. Sheep and long-haired highland cows dotted the landscape. We stopped for incredibly delicious meat pies at Mhor Bread in the cute town of Callander. 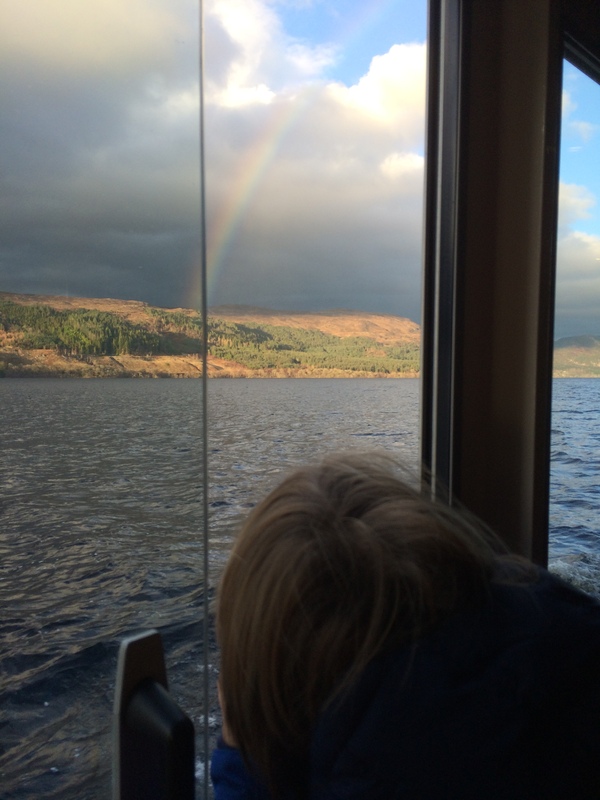 But the highlight was the surprisingly NOT cheesy one-hour boat tour on Loch Ness. It was a peaceful, pretty and SUNNY trip, even spotting a wild mountain sheep(!) perched precariously on the steep lakeside. But for me, I got a personal thrill when the skipper of the boat explained the sonar screens that were up. Each tiny little dot on the screen represented a significantly big fish, including a type of Arctic Char that got “caught” after the last Ice Age and adapted to become a fresh water fish in Loch Ness. 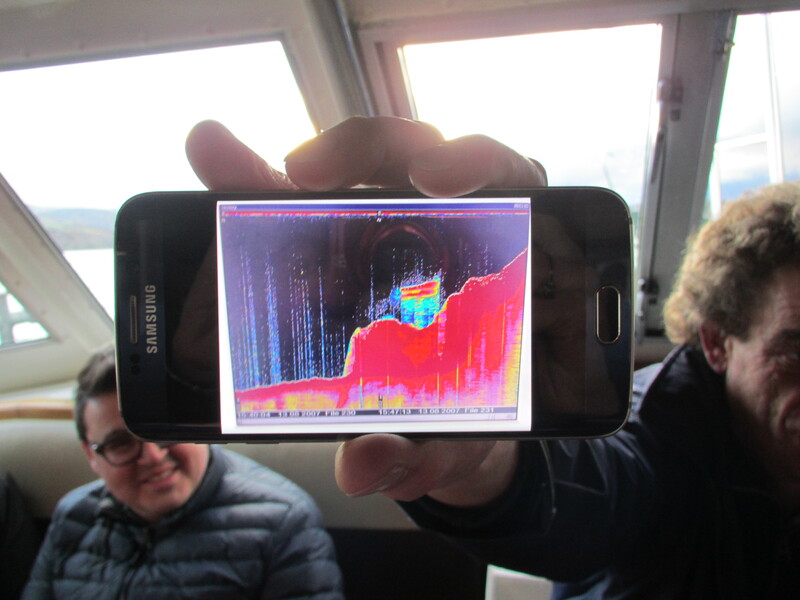 He finished by showing us photographs he has taken on his phone of sonar showing several huge shapes – very deep… Nessie! (or several Nessies, as it’s really a species). It was quite compelling! Nessie has always been a personal interest, as my father used to give a serious scientifically-based talk on the subject to various audiences. In summary, the tour was excellent and well worth it, even in winter. Side note: I kept thinking, wow, we really lucked out getting Dougie, but upon reading the reviews, it appears that all the Rabbie’s guides are of very high quality. We came away from Scotland with a real appreciation for the Scottish sense of cultural pride and culture. Edinburgh was a gorgeous city with cozy pubs and a great vibe. 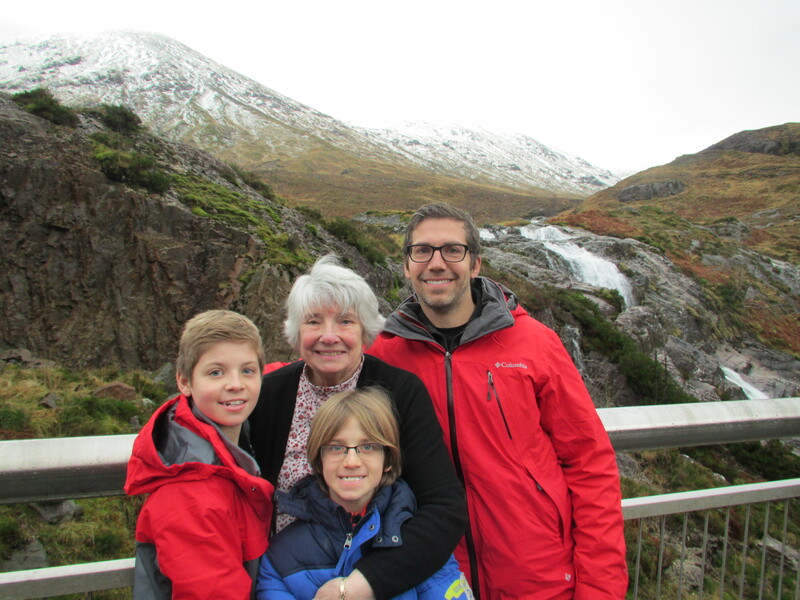 We also loved seeing Grammy, who spoiled our boys and was such an easy-going travel companion. Thank you, Scotland! We hope to come back someday soon! Awesome. Love the England/Scotland adventures!! 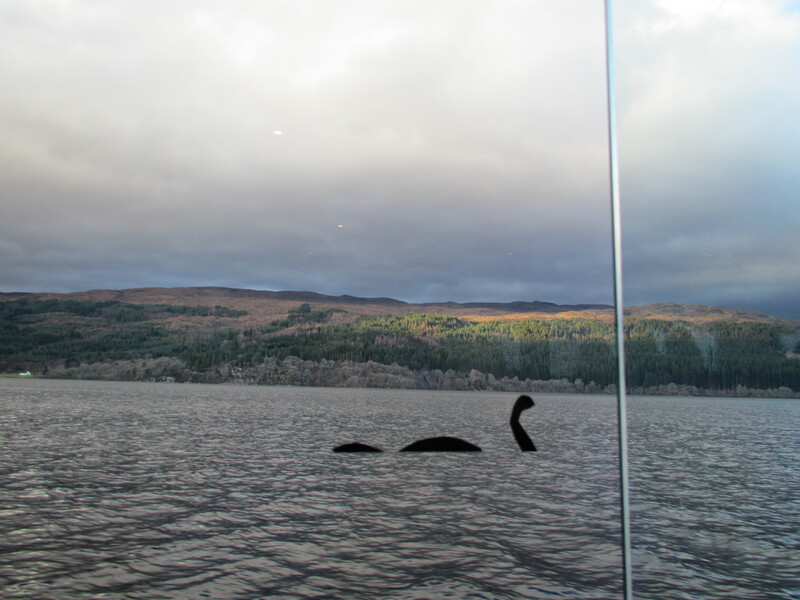 Cool to see the infared or whatever of the nessie pair! love it! You’re doing such a fabulous job with your writing I feel like I’m there with you! Miss you guys.